One of my biggest downfalls is Milo. I can go months without even being tempted, but as soon as I dip the spoon in the honey jar (so to speak), I’m hooked. Getting off it is like weaning an addict off hard drugs. In first year Uni I’d eat it mixed with hot water, cold milk (dairy was still on at this point) or dry. Spooned right from the tin into my gob. And I couldn’t stop. I’d easily devour a family bag in a few hours. And being in the thick of bulimia at the time, it would all be purged straight back out. The kids I babysat for had a silver tin of it on their bench. It would cojule me, call to me, be like Adam’s apple. I’d always tell myself I wouldn’t, not this time; I’d leave it be. But I never ever did. It used to be the joke with the parents: “Ooooooop, Poppy’s been here, the Milo tin is empty!” (I’d always leave enough for a few “normal” sized servings). When I went home to Cambridge for a Uni break, mum and my brother Michael cottoned on. Having it every morning over his weetbix, Michael would be extremely fucked off to find the tide of the tin completely out. I started secretly buying packets and refilling the tin so no one would know. Then I started buying them and hiding them in my wardrobe. I’d spray perfume to mask the malty smell when I devoured cup after cup, teaspoon by teaspoon. I used to bawl my eyes out every time I had to smuggle the empty tell-tale green foil to the wheely-bin. This is the absolute last time, I’d tell myself. Except it never was. I’d be at Countdown at least once a day buying a big bag. I used to laughingly lie to the checkout operators if they were on again from the previous day, saying I’d split my previous purchase, that I had a heap of people staying with me, anything I could think of. I couldn’t log on to Internet banking and see my statements, because the tens of transactions listed were all for the same price at the same place (unless there was a Onecard special). There was a full week when I ate nothing else. Literally nothing else. There may have been a few Diet Cokes flung in the mix, but no other food. At the end of the week I was a wreck. That was it. 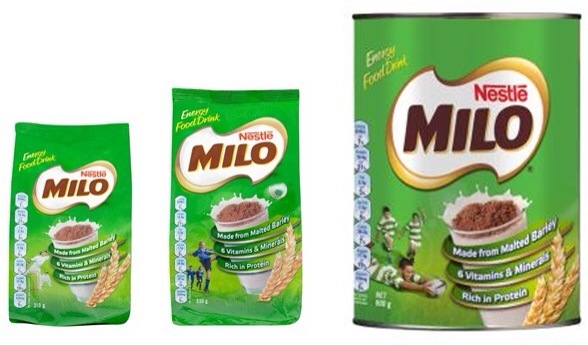 It was time to stop the manic Milo madness. It was an excruciating three weeks, but I got the habit kicked away and didn’t touch it for a full year and a half. Third year Uni my Nanna died. In the throwes of dementia, she’d had a few falls and we knew it was coming. I was living with my “second parents” in Auckland at the time, Jo and Rick. When the call came through Nanna had passed I fell to pieces, and Jo sat with me for a fair few hours as I sobbed my heart out. When I finally went to go to bed, I passed the open pantry on my way downstairs. I spied the glimmering green packet and it was like I was taken over; I snuck it downstairs with a teaspoon and ate the whole bag as tears streamed down my cheeks. The next morning I was at the New World doors as soon as it opened, praying Jo and Rick’s son wouldn’t want an early AM Milo. I raced home, emptied the replacement pack to be on par with the one I had devoured and snuck it upstairs. I didn’t have any more the next few days, but the night of Nanna’s funeral I once again became a Milo monster. We had all the family staying at our house, having come from far and wide, and I had thus given up my bedroom for my aunty. I was going to stay in my brother’s room but sleep evaded me, so I wandered the house long after everyone else had sunk into slumber. I absent mindedly opened the pantry and my eyes were immediately drawn to the king size tin of Milo, in pride of place on the shelf. Once again, before I knew it, I’d shovelled it into my mouth. The entire thing. The panic set in. I was like a crazed lunatic. I stood over the kitchen sink and shoved my hand down my throat, heaving and hulking until all I could taste was bile. I put so much force on myself that my nose started bleeding, the red rivers streaming into the brownish vomit and into the waste disposal. And it wasn’t over yet. I had to replace the tin’s contents. I snuck out to my car and drove to the twenty-four-seven BP to purchase a pack. As I drove home, I was pulled over by a police car roaming the roads for a random breath check. I freaked out. I’d had a fair few Kahlua and diet Cokes about 3pm; it may be twelve hours on, but what if they still showed? It wasn’t being DICed that had me in a frenzy. No, it was the thought of Deb catching me in my car with a big bag of Milo. I stashed the offending packet in the glove compartment and had a full on plausible story for my midnight drive, but luckily my breath test was clear and I was on my way. I got home, refilled the tin and studied myself in the window reflection. I cried and cried and cried and cried. The next morning everyone commented on how exhausted I looked. I laughed it off saying the lounge rug wasn’t all the comfiest of restin places. My cousins had hot Milos with their toast for breakfast. It’s only now I can see how truly fucked up and sick (unintentional but oh so appropriate pun) that behaviour is. I’m not ever, ever going back there.